So you got a flat tire last night. You managed to get your spare on while on the side of the street. But now what? Now you’ve got a wheel with a bad tire? Time to head on over to Elkhart Mechanics and get a new tire! They can remove the old shredded tire and put on a brand new tire. Mounting a tire can be dangerous work if you don’t have the proper tools and Elkhart Mechanics have all the tools necessary to properly mount, inflate and balance your tires. And you want to have it balanced correctly. A tire that isn’t balanced right can cause premature wear on tire and your suspension as well as making your car handle bad. So get to Elkhart Mechanics for all your tire services. Lots of places offer tire installation services, but why not have your tires installed by your friendly neighbors at Elkhart Mechanics, a full service garage that can meet all your auto maintenance needs? To avoid getting a flat tire, look for the signs that a tire is getting worn out and needs to be replaced. 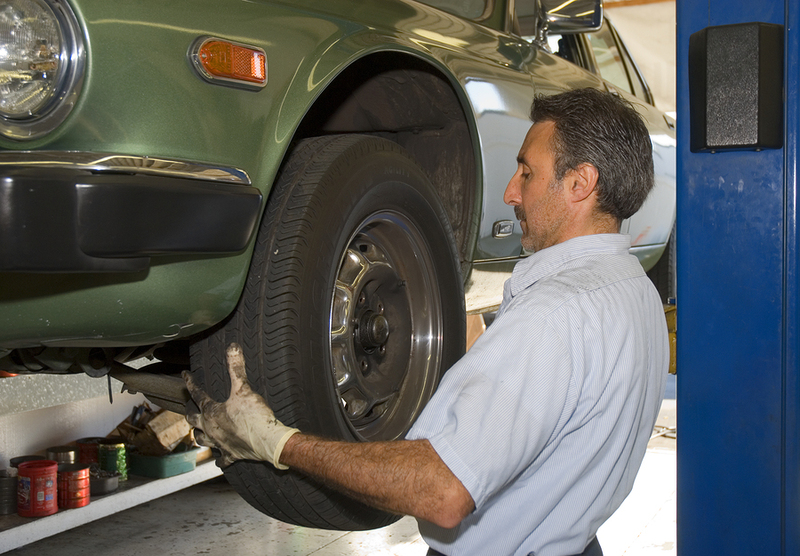 Worn out tires can also cause stress on your car’s suspension system and make it need more frequent repairs. You need new tires if your tread depth is less than 1.6 millimeters; you can check your tread depth by inserting a penny into your tread. Insert the penny head first, and the tread should cover part of Lincoln’s head if the tread depth is still good. Another sign that you need a new tire is the tread wear indicator bars. These are flat rubber bars that become visible as the tire gets worn out. More serious signs of a worn out tire include blisters, bulges, cracks, and cuts. If you see these, bring you car in to have new tires installed right away. When we install your tires, we will also remove the wheels to inspect the wheels and lug nuts and respect them if necessary. We can also install new valve systems if you need them. When we install new tires, we will also inflate, balance, mount, and seal them. We can also reset the Tire Pressure Monitoring System if you need us to. At Elkhart Mechanics, we never pressure you into unnecessary repairs or into replacing parts that still have some life in them. We will repair your tires if they can be repaired. As with all of our services, we will not keep you waiting a long time, and we will give you a fair price and only make the repairs and replacements you authorize us to make.